How buying a car can save you money! As most of you know we are on a big cost cutting, money saving campaign in this house at the moment. The big hairy northern one has got a job, but it’s a contracting job, so we decided we needed a more detailed plan and budget. We want to insure against was sudden big bills. What was concerning us most was cars. Firstly there is petrol. Then there is the sudden big bills of tax, MOT, insurance, tyres and servicing. My service is technically paid for but I still got a sudden ONE THOUSAND POUND bill a couple of months ago and the guy gleefully told me that there was ANOTHER £1000 that I could do, but wasn’t mandatory (no I did not pay it take the option of paying more, funnily enough!). Gulp. Plus I was missing a spare tyre (thanks to some thieves) and spare key. The hairy northerners car is even worse. So off we went researching whether selling our cars and buying newer more economical ones would save us money. And the answer is yes. Did you know that some cars pay no road tax or congestion charge, plus there are all sorts of deals around for warranties etc? The cost savings you can make are amazing now a days. Now don’t hate me when I show you what I got – one of my friends hit me when I told her! 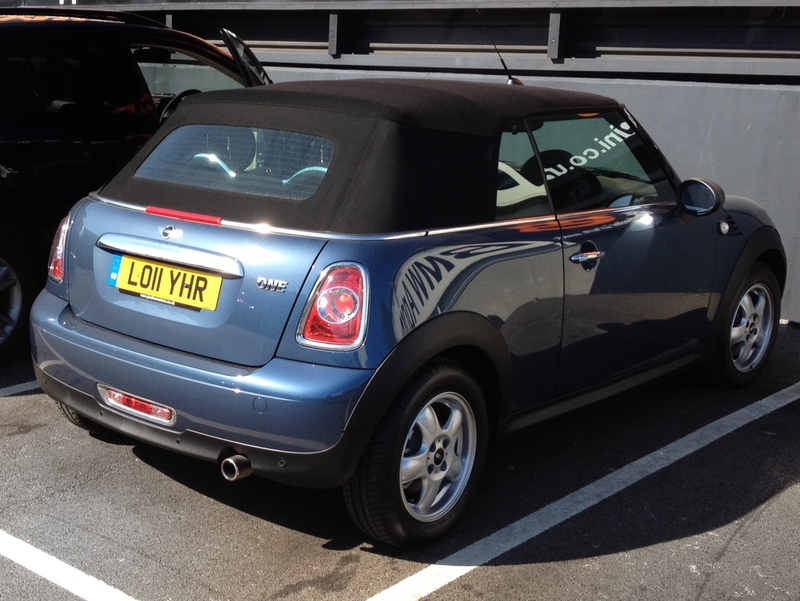 Meet Lolly my new mini one convertible to replace my hybrid 4×4. Yay! I’m still jumping up and down with glee. Next month the hairy northern one will be swapping his Honda Civic Type R 2 door, for a funky little Red Honda Jazz with a glass roof and an amazing amount of tardis like room inside. Both are newer, with less tax, lower insurance, better petrol consumption, cheaper tyres, and warranties for years. Yearly mileage x petrol consumption. How much it will lose in value each year. The INITIAL COST of the new car = The PRICE of the New Car – How much you’ve been offered for your current car. Decide HOW LONG you want to compare the cars for. We chose 1yr for my mini and 4yrs for the Honda. I’ve assumed that your new car will cost more than the old one, but of course for some of you that might not be true. You could buy a cheaper car, or swap your old one for a new one at the same price, but less luxurious. Apparently there are tonnes of people doing this at the moment. The best time to buy newish cars is at March or September when the new reg is coming out or just after, because dealerships ‘pre-register’ cars so that they hit their targets and then sell them without VAT afterwards. Remember a totally new car loses 20% VAT in value the minute you drive it out of the car showroom unless you have got a major deal on it. Depreciation is how much your car will lose in value each year. You can tell by looking up used cars of different years and work out the loss in value. New Cars don’t need an MOT for 3 years. Service costs tend to fluctuate depending on how many years old the car is. The garage will be able to give you an estimate. Shop around. Some garages will give you a better price for your current car than others. Some will do a better deal. Honda gave us a great price for my non-honda car, which was a big surprise. Don’t buy anything on the day. Do your research first, then hit as many garages as possible in a short time. Phone them in advance and make sure you have test drives set up. Warn them you have kids and can’t faff around. Take snacks and toys for the kids, but then use them as an excuse to have to go away before signing on the dotted line! I will add a couple of extra points aimed really at the dealers following our experiences over the last few weeks. 1. If your website says you open at 9am on a Saturday then don’t pull all the Sales team in a room for an hour. Leaving ever more courteous receptionist to cover the phones promising to get someone to call back when they are free isn’t a good customer experience. 2. When a potential customer calls call them back, they really may want to actually buy a car from you. 4. Try to treat the kids as part of the family you are trying to sell a vehicle to. Do not ignore, or worse tut under your breath if the 2yr old is getting fractious after a two hour stretch in the showroom. 5. If you have a TV switch it to a kid friendly channel, offer them drinks. Happy kids = more likely sale.